That's one angle we had on the final three minutes of the South Park Bridge's life - as the gates went down, the warning bells and siren sounded, and then, ... Read more..
Just got word of this. It's open to the public. 10 am tomorrow (Thursday) morning, the North Highline Board of Fire Commissioners meets, with two items on the agenda: "New-hire ... Read more..
(Photo courtesy King County Department of Transportation) The bus reroutes kicked in this morning; the bridge closes tonight. Here is a preview from partner site West Seattle Blog. Note that the ... Read more.. The agenda's up, and it includes a scheduled appearance by two high-ranking King County Sheriff's Office leaders. The King County "brownfields" program is scheduled to be discussed too - here's ... Read more..
That's the "book trailer" published to YouTube last December for "The Car That Brought You Here Still Runs," Frances McCue's look at the towns visited, and written about, by Richard ... Read more.. Thanks to Gill for the photo - apparently if you catch that sign at just the right instant, half the illuminated words and numbers disappear. The handwritten sign below, however, ... Read more..
As reported here Thursday and Friday, White Center's popular storefront-based King County Sheriff's Deputy Jeff Hancock is leaving WC. We've since received from a source an e-mail circulating in the ... Read more..
From the weekly preview sent around by the King County Council - see what's in the works for next week, after the jump: Read more..
$10 million more today, according to County Councilmember Jan Drago's office. 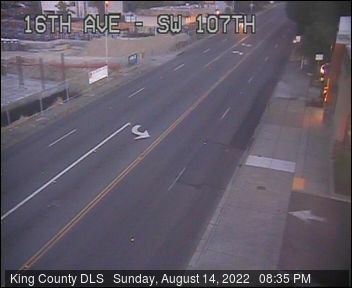 Meantime, counting down to closure of the old one - 7 pm Wednesday, if for some reason you hadn't ... Read more..
We promised a followup on last night's confirmation from King County Sheriff's Office Community Service Officer Vary Jackson that Deputy Jeff Hancock says he's leaving White Center. Deputy Hancock has ... Read more..
... and, says the Transportation Department's Road Services Division, the road is reopened. Read more..
More news from the White Center Eagles - a swap meet tomorrow! : Saturday, June 26, 2010, 9 am to 5 pm - White Center Eagles, 10452 15th Ave SW. Spaces are ... Read more.. ORIGINAL 6:35 PM REPORT, POSTED AS-IT-HAPPENED: About 20 people are at the White Center DSHS offices for tonight's White Center/South Delridge Community Safety Coalition meeting. Early in the meeting, Liquor ... Read more..
With the questions about recent incidents including the one discussed further down the page here (a big law-enforcement response early Saturday), plus concerns over the future of White Center's storefront ... Read more..
(County Councilmember Julia Patterson, one of the many elected officials who spoke at today's announcement) Just back from covering the official announcement of $20 million in state money for the South ... Read more..
Kemp Garcia e-mailed to say: "Wednesday night starting at 5 PM we are doing a pulled pork dinner again at White Center Eagles. It is open to families, and ... Read more..
From WestSide Baby, which was awaiting exact delivery time of a huge diaper donation from Huggies: As part of the WestSide Baby Community, we thought you'd want to be the first ... Read more.. Announced late today by the King County Council: With King County’s general fund facing a $140 million deficit over the next two years and public safety services in jeopardy, the Metropolitan ... Read more..
View Closed in a larger map Reminder of a road closure previewed here last week - 7 am today is when SW 100th is supposed to close between 13th and 12th ... Read more..